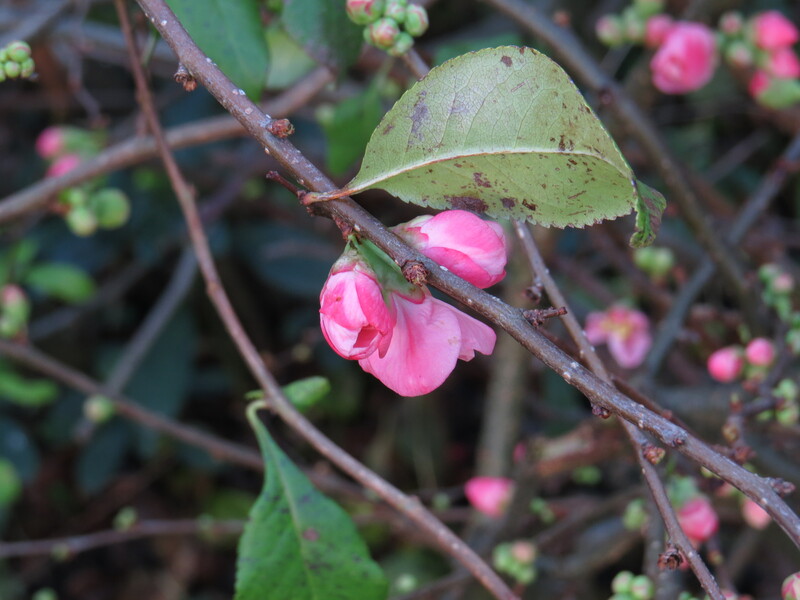 Dear Readers, whenever you read a book about winter-flowering shrubs, flowering quince is sure to be one of the top five. It is, however, a confusing plant. For one thing, it isn’t the ‘true’ quince (Cydonia oblonga), although it is related to it. All quinces flower, so there is nothing unusual in the fact that this one is in bloom. It is also known as the Japanese quince, which is a little closer to the mark as all Chaenomeles come from the Far East, but the true Japanese Quince (Chaenomeles japonica) is rarely grown in gardens. In short, the common names for the plant do nothing but pile confusion on top of confusion. However, I forgive all this because, in a chill, sunny day earlier this week, this plant was by far the prettiest thing in Hampstead Garden Suburb. 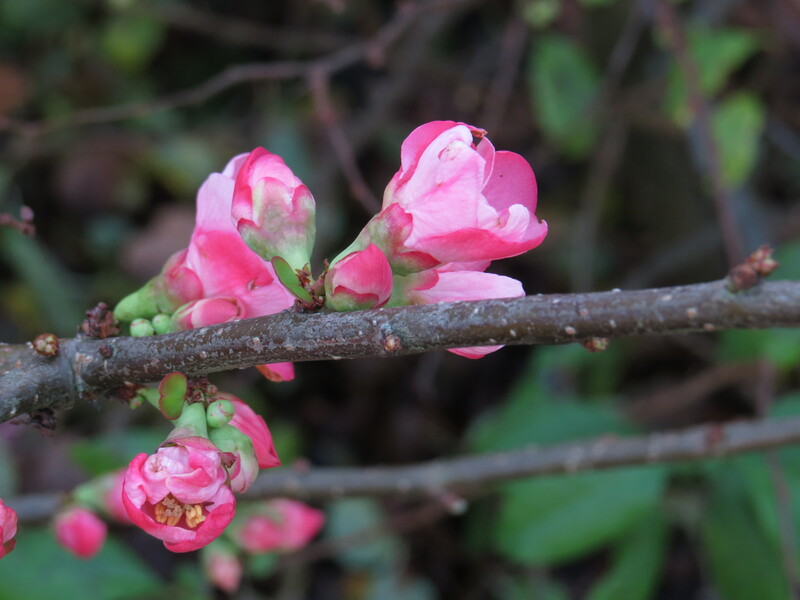 One feature of the flowering quince is that the flowers emerge directly from the stalk, before the leaves. It was the first time that I’d seen a pink variety – the ones in the County Roads here in East Finchley are normally the orange-red variety. Flowering quince also has the virtue of being quite a spiny plant (it is a member of the Rose family after all) and I have seen it combined in hedges with such well-armed shrubs as Pyracantha. It is quite often ‘persuaded’ into miniaturisation as a bonsai. Let us not completely overlook the fruits either. They are hard, sour and small, though this is ameliorated somewhat after the first frost. However, they can be used as a substitute for lemon juice, or turned into jelly, much as crab apples are. The Grown to Cook website has a recipe for Japanese quince jelly with star anise, and the photos are lovely too. In Japan the fruit is known as karin or flower pear, and commands a high price, so if you have one of these shrubs in your garden I’d have thought it would be worth harvesting the fruit to see what you can do with it. Some websites recommend combining it with apples to offset its astringency. Note that it is also extremely high in pectin, so helps with the set of jams and jellies. 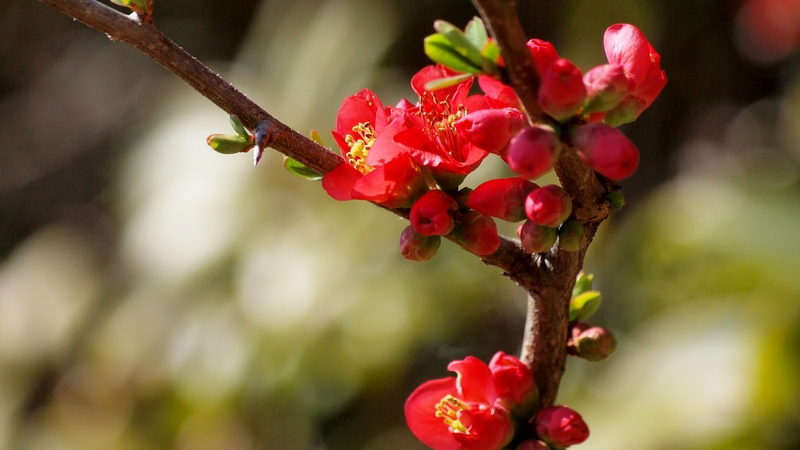 In Japan, the fruit of flowering quince is also used to make cough and sore throat remedies. The botanist James Wong mentions that for Japanese people, Chaenomeles cough sweets take the place of our honey and lemon. He also mentions that Russian scientists introduced the plant to the Baltic states as a source of vitamin C – the fruits have a slightly higher level than lemons – and so the plant is sometimes known as ‘Baltic lemon’. Flowering quince features extensively in the art of Japan. 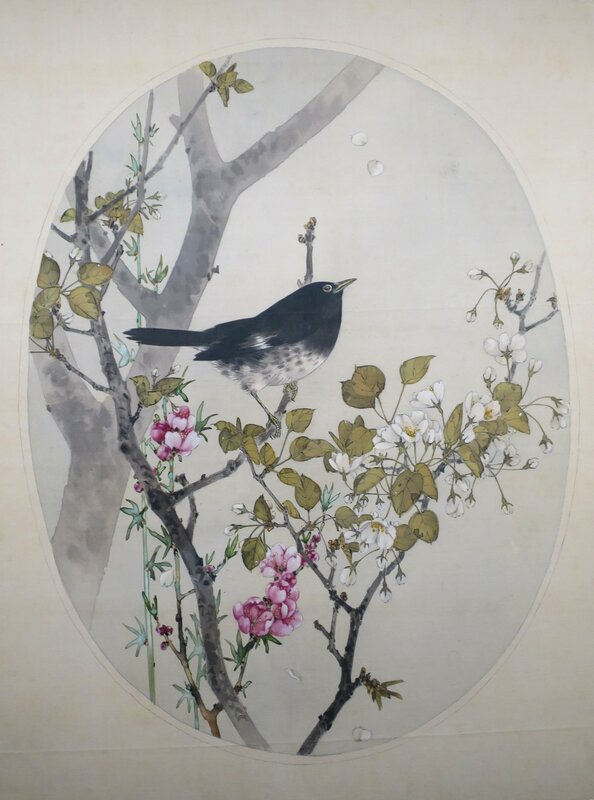 Here, for example, is the artist Watanabe Seitei’s painting ‘Japanese Thrush with Flowering Quince and Wild Cherry’ – I love that the flowering quince in the image looks so similar to the one that I saw. This entry was posted in London Plants on December 5, 2018 by Bug Woman. 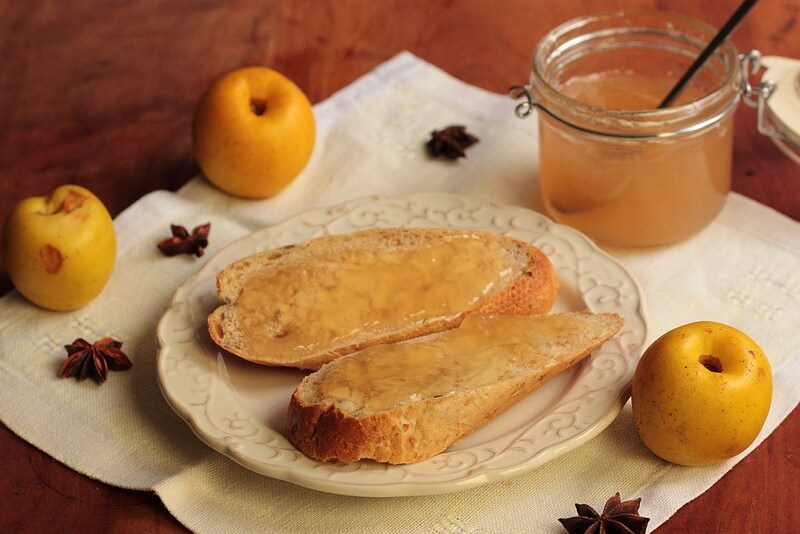 In years when we get enough fruit, I make quince jelly – the biggest challenge is cutting the really hard fruits! I know! They are always quite alarming to prepare, much like pumpkins. I am always imagining that a trip to A&E will be required, what with my excellent knife skills and all…. 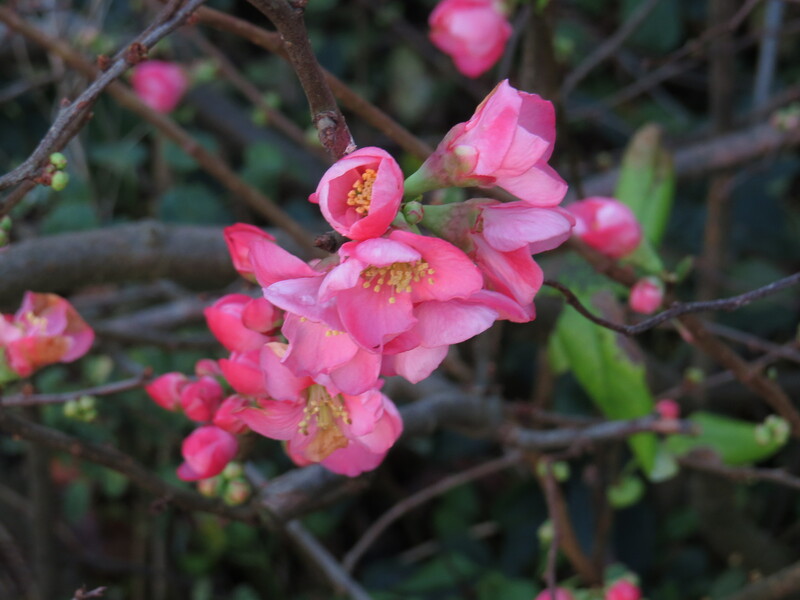 I was interested to see that the Japanese Quince is “the birthday flower for 21st December”. I’ve never heard of birthday flowers before, and would like to know mine! Sadly a Google search hasn’t made me any wiser. I love the John Galsworthy story. It seems to be about the sadness of living a life divorced from nature and human connection. I hope Mr Nilson and Mr Tandram took their frock coats off and had a picnic, but I don’t suppose they did. Ah, interesting. Yes, there is a sense of stultifying domestication, isn’t there. Well done for finding the quote, what a good memory you have! Hi Sarah, I can’t find a list of birthday flowers either, but! you might be interested to find out what your birthday represented in the French Revolutionary calendar. Enjoy! Sarah’s right about the story, I think. The two men are wealthy but spiritually impoverished. Maybe they are related to some of those dreadful Forsytes. A nice little animation could be made of the story; it’s so visual. I have no ideas on the story but I really like the colour of that Quince blossom. It’s beautiful, isn’t it. It reminds me a bit of a Christmas cactus. Those are SO classic. I sometimes see them regenerate in the gardens of new homes that were build on the sites of old homes. Even after the old gardens are gouged out, some of the old classics regenerate. They are truly ‘sustainable’ but are surprisingly uncommon in nurseries. We have a few here. We intend to pry a few rooted sideshoots off to make more copies of them. They are absolutely gorgeous, aren’t they. What time of year do they flower in your part of the world? One of the big bonuses in the UK is that they are in flower when pretty much nothing else is…. The earliest bloom in late autumn, although I do not know of any blooming yet. Some bloom in winter, and the latest might bloom in spring. The old cultivars tend to bloom in winter. Modern cultivars bloom a bit later in very early spring. Some stick to a tight schedule. Others might bloom later or earlier than they typically do. Consequently, they do not always bloom in the same sequence.